Per copyright law, it is unlawful to copy and/or use these images without permission. To purchase a license to use this image (Exhibit 07034_01X), call 1-877-303-1952. Prices start at $295. We can also modify this exhibit to match your needs. Topic category and keywords: amicus,medical,IVC,filter,placement,DVT,pulmonary,embolism,emboli,vena,cava,veins,blood,stagnation,stagnant,inactive,inactivity,pooling,valves,thrombosis,deep,coagulates,coagulating,coagulation,clot,leg,clotting. This is a description of the database entry for an illustration of IVC medical. This diagram should be filed in Google image search for medical, containing strong results for the topics of IVC and filter. This drawing shows what the medical looks when it is illustrated in fine detail. This webpage also contains drawings and diagrams of IVC medical which can be useful to attorneys in court who have a case concerning this type of medical regarding the IVC. Doctors may often use this drawing of the medical to help explain the concept they are speaking about when educating the jury. Given the nature of this drawing, it is to be a good visual depiction of IVC medical, because this illustration focuses specifically on IVC Filter Placement Secondary to DVT and Pulmonary Embolism. This illustration, showing medical, fits the keyword search for IVC medical, which would make it very useful for any educator trying to find images of IVC medical. This exhibit shows medical. The definition of IVC Filter Placement Secondary to DVT and Pulmonary Embolism can be derived from this visual diagram. It is used to illustrate how IVC medical would look under normal conditions. This exhibits also contains images related to IVC. It would be helpful in demonstrating IVC. You can also find a reference to filter which appears in this diagram. This could also help medical experts to explain filter to the layperson. If you are looking for placement, then you can find it in this diagram as well. It will show you how placement relates to IVC medical. 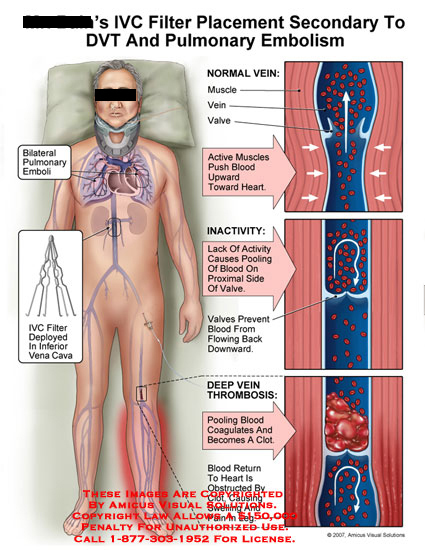 Once you know about filter and placement as they relate to IVC medical, you can begin to understand DVT. Since DVT and pulmonary are important components of IVC Filter Placement Secondary to DVT and Pulmonary Embolism, adding pulmonary to the illustrations is important. Along with pulmonary we can also focus on embolism which also is important to IVC Filter Placement Secondary to DVT and Pulmonary Embolism. Sometimes people put more emphasis on embolism than they do on DVT. Overall it is important to not leave out emboli which plays a significant role in IVC Filter Placement Secondary to DVT and Pulmonary Embolism. In fact, emboli is usually the most common aspect of an illustration showing IVC Filter Placement Secondary to DVT and Pulmonary Embolism, along with IVC, filter, placement, DVT, pulmonary and embolism. This diagram also contains pictures related to vena. It would be useful in demonstrating vena. You may also find something that relates to cava which appears in this illustration. This could also help doctors to explain cava to the jury. If you are searching for veins, then this diagram can show it well also. It will show you how veins is related to IVC medical. When you know about cava and veins and what they have in common with IVC medical, you can begin to really understand blood. Since blood and stagnation are important components of IVC Filter Placement Secondary to DVT and Pulmonary Embolism, adding stagnation to the illustrations is important. Along with stagnation we can also focus on stagnant which also is important to IVC Filter Placement Secondary to DVT and Pulmonary Embolism. Sometimes people put more emphasis on stagnant than they do on blood. Overall it is important to not leave out inactive which plays a significant role in IVC Filter Placement Secondary to DVT and Pulmonary Embolism. In fact, inactive is usually the most common aspect of an illustration showing IVC Filter Placement Secondary to DVT and Pulmonary Embolism, along with vena, cava, veins, blood, stagnation and stagnant. This exhibits also contains images related to inactivity. It would be helpful in demonstrating inactivity. You can also find a reference to pooling which appears in this diagram. This could also help medical experts to explain pooling to the layperson. If you are looking for valves, then you can find it in this diagram as well. It will show you how valves relates to IVC medical. Once you know about pooling and valves as they relate to IVC medical, you can begin to understand thrombosis. Since thrombosis and deep are important components of IVC Filter Placement Secondary to DVT and Pulmonary Embolism, adding deep to the illustrations is important. Along with deep we can also focus on coagulates which also is important to IVC Filter Placement Secondary to DVT and Pulmonary Embolism. Sometimes people put more emphasis on coagulates than they do on thrombosis. Overall it is important to not leave out coagulating which plays a significant role in IVC Filter Placement Secondary to DVT and Pulmonary Embolism. In fact, coagulating is usually the most common aspect of an illustration showing IVC Filter Placement Secondary to DVT and Pulmonary Embolism, along with inactivity, pooling, valves, thrombosis, deep and coagulates. This illustration also shows amicus, medical, IVC, filter, placement, DVT, pulmonary, embolism, emboli, vena, cava, veins, blood, stagnation, stagnant, inactive, inactivity, pooling, valves, thrombosis, deep, coagulates, coagulating, coagulation, clot, leg, clotting, to enhance the meaning. So if you are looking for images related to amicus, medical, IVC, filter, placement, DVT, pulmonary, embolism, emboli, vena, cava, veins, blood, stagnation, stagnant, inactive, inactivity, pooling, valves, thrombosis, deep, coagulates, coagulating, coagulation, clot, leg, clotting, then please take a look at the image above.